Pets are a very important part of our lives. They give us unconditional love. They greet us at the door when we come home and they are always happy to see us. When our beloved pet dies, we lose a member of our family. Saying goodbye can be hard and painful. 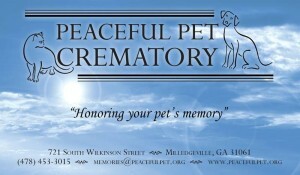 At Peaceful Pet Crematory, we try to understand your grief and we want to help. When you suffer a devastating loss that is so deep, you wonder if anyone else could possibly understand. We do as people who have loved and lost pets of our own. We offer our deepest sympathies. Private – With this selection, your pet is placed in the cremation chamber alone. The ashes will be returned to you in a temporary urn along with a Certificate of Cremation. Communal – With this alternative, your pet is cremated along with a number of other pets. The remains are not returned. Call for prices of pets above 120 pounds. 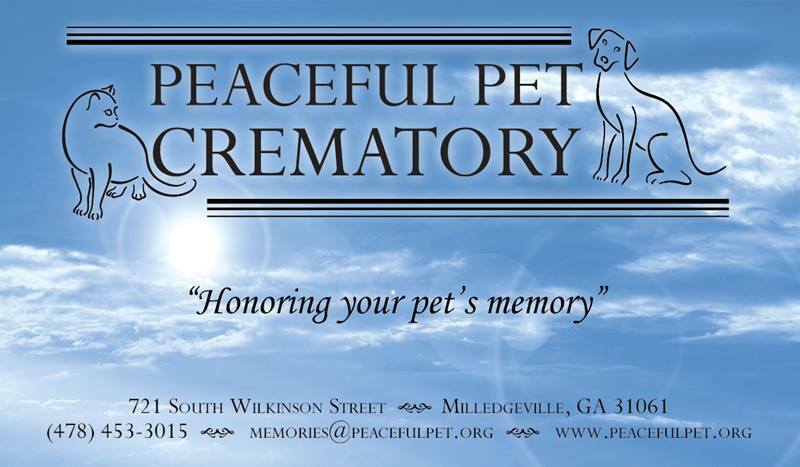 Our love for dogs and cats was the driving force behind Animal Rescue Foundation, Inc.’s (ARF) decision to open Peaceful Pets Crematory (PPC). This was not a project we could afford to tackle alone, but with the help of many volunteers, and several local businesses, we gave it a try. Working with both the public and local veterinarians, PPC had become a successful non-profit organization. Though it is a stand-alone business, 100% of the profit from PPC goes directly to ARF…..100%. Pickup Service: Residential – If your pet passes away at home, we are available to pick up your pet’s remains and will make every effort to work with you to meet your needs. The pick up fee for Baldwin County residents is $50.00. Contact us for pick up fees outside of Baldwin County. Veterinary Clinics – You may also transport your pet’s remains to your veterinarian’s office. We will pick up from Baldwin County veterinary clinics at no charge. Drop off – If you prefer to transport your pet to our location, please call us for arrangements.